I know I haven't been updating my blog for the longest time. I have been busy taking care of the two little ones that I have no time to go out and dress up! I took a 6 months leave from work and hence been a full time mum for months now. Who would want to see posts of me in ratty old jammies & sleep dresses in my personal style blog? No one! Hahaha. Anyways, yesterday we celebrated my MIL's birthday and I finally got to dress up again! Woopee! 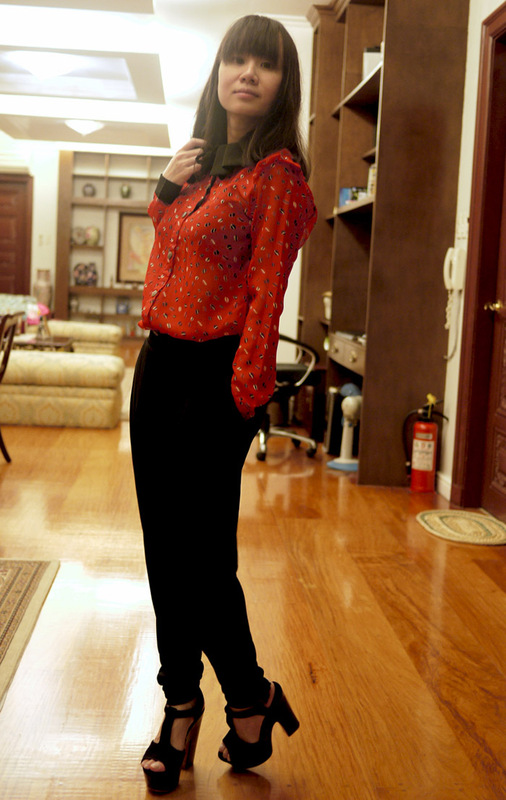 So I decided to wear this sheer printed red blouse with my ever comfy matte jersey trousers fron Giordano Ladies. Have I told you guys how much I adore Giordano Ladies? My closet is filled with clothes from them. Hahaha. I was suppose to wear my black oxfords but decided to wear these chunky platforms from Primadonna instead. Since I know there would be no running around after the little monster aka Eli involved. I swear I really do miss wearing my sky high platforms.